In this seafood chowder recipe I’ve used milk instead of the usual double cream, which reduces the calories. 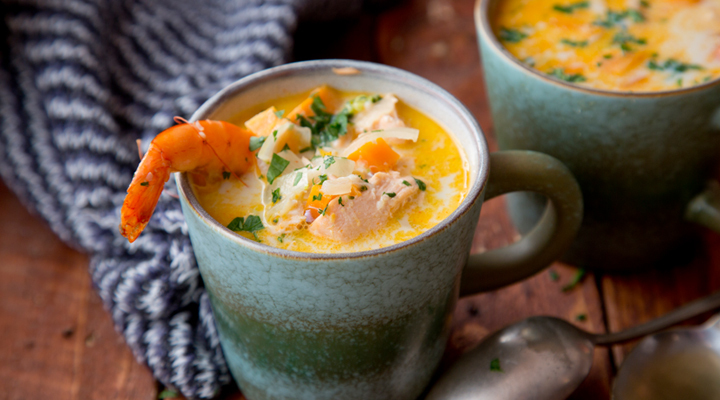 By making your own homemade fish chowder, you can add lots of extra vegetables too if you like. 1. Pour the milk into a saucepan and set over a medium heat. Add the fish mix and bring up to a steady simmer, then poach for 10 minutes. Strain the milk into a bowl and set the fish aside on a plate. 2. Heat the oil in a pot set over a medium heat, then fry the onion and garlic for 5 minutes. Add the carrots, sweet potatoes and broccoli and sauté for 5 minutes. Add the reserved milk and simmer for 25 minutes, until the sweet potatoes are soft. Add the poached fish and the prawns and simmer for 5 minutes more, until the seafood is heated through. 3. To serve, ladle into bowls and garnish with the chopped parsley. Tip: There’s no question that cream makes chowder taste better, so if you don’t mind the extra calories, then add in some double cream along with the milk. It will still be a super-nutritious meal, just a bit more energy dense.